Popular Hausa (Kannywood) actor, Adam Zango, recently went on Desmims TV to refute claims that he is gay. Adam, who was a guest on the TV stations talkshow, held a Koran and swore that he was not gay and will never be. 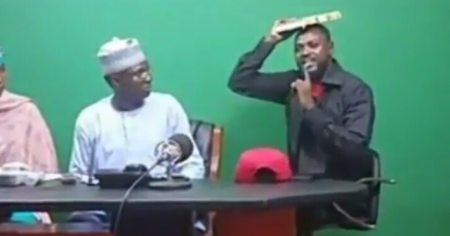 “I am here to tell the whole world that I am not gay and I do not participate in any gay activities within and outside the Kannywood industry” he said. Many of the actors in Kannywood have been taunted with rumors of being gay.